"Nine traditional ale malts, Cascade hops and Michael's favourite ale yeast. Pale - as in not black - with a vibrant, piney bouquet of hop-driven citrus. A finely tuned balance of power: big malts and big hops underpin this beer's high gravity. A West Coast style IPA which boldly declares that 9 is the new 10." On draught at the Morrisey House. Pours a mahogany rusty brown. One finger of slightly off white head. 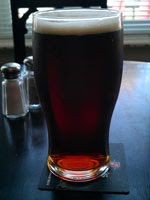 The head dissipates quickly as it clings to the glass with some lacing present. Some malt sweetness up front, slight bitterness. Very chilled beer, not getting huge notes. Pretty mellow over all. The maltiness is a very present but not over powering. Some caramel sweetness. Towards the top of the mouth there is some slight lemon peel and citrus. Towards the back of the mouth there is some earthiness before a rewarding bitterness. Silky mouth feel, not overly carbonated. Over all a decent beer. Similar to Mill Streets Tankhouse Ale, after all Duggan's headbrewer used to brew for them. This tends to be more bitter than the aforementioned, and not as complex a hop profile. I wouldn't describe the hop or malt flavours as huge, but still pleasant. I would enjoy again. I would rate this a B.